D & K Reptile Sales, LLC has been in business since October 2004. Owned and operated by my wife, Kylila, and myself. We truly are a family first business. We look forward to when our children, Connor, and Hannah, will be working side by side with us… they already share our passion. We have over 30 years of experience with exotic animals, primarily reptiles and mammals. We started as a small reptile breeder and wholesaler. We are of an animals first mindset. We pride ourselves on the quality of our animals and the network of keepers/breeders we have developed over the years. Our first two years were spent mostly on colubrids and small lizards. In late 2005 we purchased our first ball python morphs and things really took off for us. The first 7 years saw us outgrow our garage and basement. We had always dreamed of owning our own pet shop. In 2011 we began a search for a warehouse style building to move our reptiles and rodents. We found the perfect building just blocks from our house. It was perfect to make the front a small retail space. 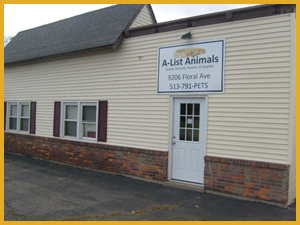 A-List Animals was created in May 2011 and officially opened in October of that year. We are Cincinnati’s only reptile specialty pet store. We treat the store like a reptile show. Great selection and low prices on everything you need from animals to supplies to feeders. We have continued to add a number of breeders, including ball pythons, Columbian boas, Angolan pythons, sand boas, hognose, colubrids, crested geckos and bearded dragons. We have also set up breeding groups of Monkey Tail Skinks, Gila Monsters and Giant African Millipedes. In 2010 I partnered with Chris MacMillan and John Chausmer to create the Cin City Reptile Show, Inc. We may be biased but this is the best monthly show in the Midwest. In 2013 our group added the Kentucky Reptile Expo. In November of 2013 I left my full time job to manage the shop permanently. We have met or exceeded all of our goals in the first year and our future looks bright. We value each and every one of our customers and strive to keep our customers for life. Thank you to you, our customers, for helping us realize our dreams.